This week we bring some extra-exciting changes to Black Desert Online! Execute with 100% accuracy with the new Guaranteed Enhancement items. Added in are three different kinds of new blackstones to help you get your gear in tip-top shape! We also bring Instant Potions to give you that much needed boost when you need it most. Squad up with your Guildies. In addition to the refreshed Guild Attendance Rewards, we are doubling the rewards for completing Guild Missions. All of this and more are awaiting you in these patch notes so keep calm and read on! ◈ Double the rewards! 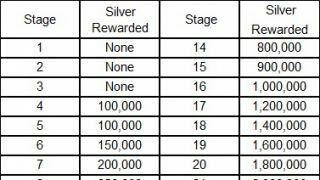 A new event where Silver and Guild EXP given as Guild Mission completion rewards are doubled has been added. 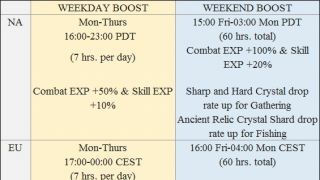 • During this period, amount of Silvers and Skill EXP given for completing Guild Missions will DOUBLE. • Event period: 8/8 After Maintenance ~ 8/29 Before Maintenance. ◈ The duplicated buff icon misplaced on top of the client screen has been removed. • Mount EXP +30% can be checked under the EXP buff icon. • You can still exchange [Event] Serbianca’s Vouchers for Logs until 8/18 before maintenance. ◈ Instant HP Potion (S, M, L, XL) and Instant MP(EP)/SP/WP Potions (S, M, L, XL) have been added. 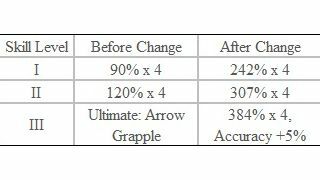 • Though the HP/MP amount recovered is same as before, the cooldown is 2 sec. ◈ Guaranteed Enhancement has been added. 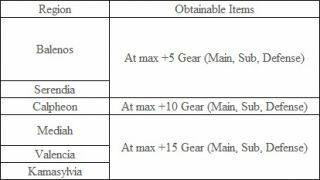 • Now you can perform Guaranteed Enhancement on Main Weapon, Sub-weapon, Awakening Weapon, Helmets, Armors, Gloves, and Shoes. 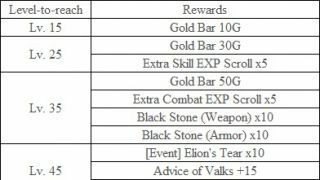 • Upon using the following items and performing Guaranteed Enhancement, you will consume 30 Durability and obtain 100% chance of successful Enhancement. 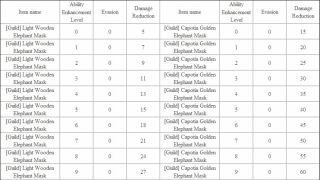 • Allows you to perform enhancement on green-grade gear from +13 until +15. 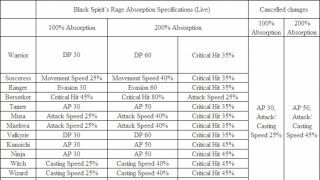 • Allows you to perform enhancement on blue-grade gear from +13 until +15. 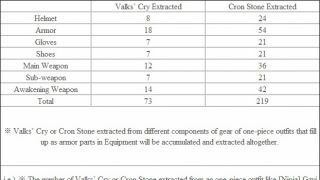 • Allows you to perform enhancement on yellow-grade gear from +13 until +15. 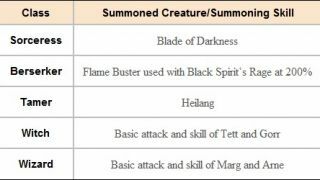 ※ If a gear is reformed, you will need to use the same type of Magic Black Stone that you would need for the non-reformed version of the gear. ◈ The Magic Black Stones are obtainable from defeating World Bosses and Field Bosses. ◈ They are NOT marketplace-registrable. 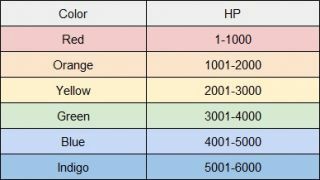 ◈ Please click <Here	> for our official Wiki guide on Enhancement. 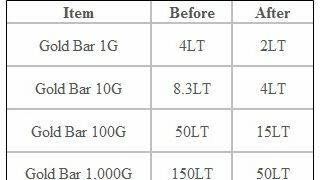 ◈ It has been changed that items cannot be moved around inside Inventory while Enhancement is under progress. ◈ New challenges, “Gorgath's Gift” have been added under Challenges (Y). • The challenge can only be completed once per Family. • If you have already achieved Lv.54, you will have completed the relevant Challenge automatically upon logging-in. 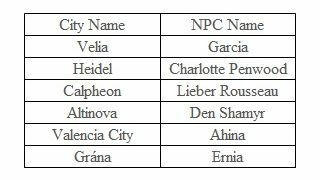 ◈ If you design a class-specific Calpheon Noble Dress or Calpheon Noble Suit for the first time, you will receive the relevant Costume Crafter title for that specific class. 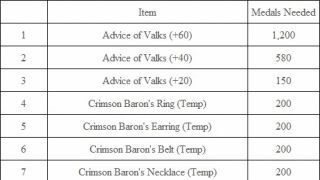 ◈ If you design a class-specific Calpheon Noble Dress or Calpheon Noble Suit ten times, you will receive the relevant Costume Expert title for that specific class. ◈ A new system message will now be displayed upon destruction of Command Post/Forts during Node and Conquest Wars. ◈ Fixed the issue where character set for Tag could escape from Jail fast. ◈ The Navigation near Western Guard Camp and Altar of Agris has been improved. ◈ Guard NPC under battle with Steel Imps has been added to Western Guard Camp. ◈The camera perspective of Edan located in Valencia Castle has been changed. ◈ In order to fix the difficulty in boarding your ship when multiple ships are crowded together, it has been changed so that clicking on the Ship icon on the top-left corner would teleport you instantly to the steering wheel of your ship. • Click on the Ship icon while on standby or swimming to move to the steering wheel of your ship. 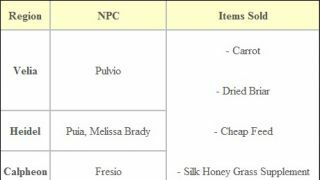 ◈ The text that appears at the Stable when selling your horse to the Imperial Horse Delivery has been changed. 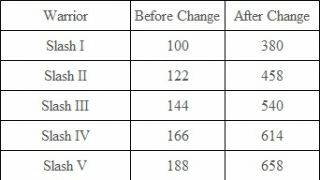 ◈ Damage Reduction effect has now been decreased by 5% during PVP. ◈ Fixed the graphical abnormality in the shadow of the characters distant away. ◈ Fixed the issue where the characters’ hair would seem to disappear at a certain angle when having [Event] Sweet Cone Hat on. ◈ Fixed the graphical awkwardness in the hair part when equipping Snowflake Hat for Wizard, Warrior, and Striker. ◈ Fixed the issue where the skill Flow: Crossing Wind I could be used even when the skill had not been learned. ◈ Fixed the issue where the side hair in one of the types of hair of the Ranger would disappear upon wearing Coco Hat. ◈ Fixed the graphical issue where the ground would be flickering when using the skills Voltaic Pulse or Thunder Storm. ◈ Fixed the graphical awkwardness in the shoulders of the Witch while having Winter Snowflake outfit equipped and leaning on a wall. ◈ Fixed the issue where Knockback effect of the additional hit would not be applied for the skill Counter Assassination in PvE. ◈ Fixed the graphical awkwardness in parts of the hair of the character upon equipping Lahr Arcien Helmet (R). ◈ Fixed the issue where Bound effect would be applied to the grabbed target when using the skill Massive Suppression. ◈ Fixed the wrong descriptions in the skill Spiral Cannon. ◈ Fixed the graphical awkwardness in the chest area of the character when equipping Sanguine Petal armor and Priyah Bikini together. ◈ It has been changed that Lafi Bedmountain's Upgraded Compass’s cooldown will be reduced even after disconnecting from client. ◈ Navigation to the location of spawn for the item Ancient Ruins Key has been improved. • Use the item at the designated location to summon the Defender of the Ancient Holy Ground. • Fixed the awkward line breaks in the item tooltip of Ancient Ruins Key. • The summoned Defender of the Ancient Holy Ground will disappear after 10 minutes. ◈ Fixed the issue where certain items would wrongfully display their expiration date to be 7 days. ◈ Gray Wolves located near Western Guard Camp have increased in number. ◈ Shadow Knights located near The Watchtower have increased in number. 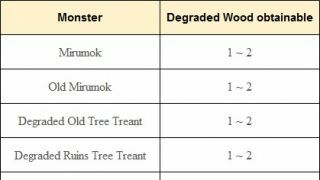 ◈ Some goblins that appear near Cron Castle Site have been relocated. ◈ Defender of the Ancient Holy Ground that spawns from using Ancient Ruins Key will now die after 10 mins. 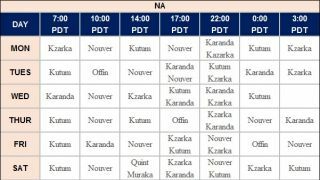 ◈ Fixed the issue where World Boss Karanda would look transparent intermittently if you restarted client through Character Selection window while battling it. ◈ The loot from hunting Blue Whale and Khalk has been changed. 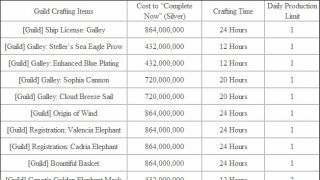 • The following items have been removed from the loot for hunting Blue Whale and Khalk. 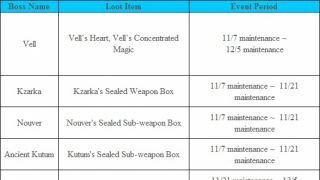 ◈ The drop rate of the following loot items has been changed. ◈ Difficulty of the quest [Solo] Narc Magic Sealing Stone has been lowered. • DP of the Narc Brishka that spawns in the quest has been decreased by 60%. 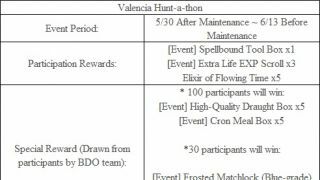 • However, EXP obtainable for completing the quest has been decreased by 50%. ◈ It has been changed that interacting (R) with NPC Datu Varudatu will gain you its Knowledge now. ◈ Fixed the issue where the title ‘Al Rhundi Champion’ could not be obtained upon completing the quest of defeating Al Rhundi. ◈ Fixed the issue where Terrmian Waterpark’s special quest [Event] Meals Are Not To Be Skipped did not disappear and could still be accepted. ◈ Fixed the issue where the prop appeared to be located below a table in Place mode of your Residence. 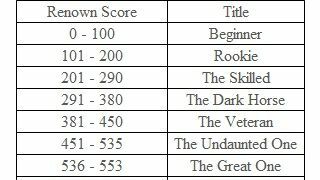 ◈ Fixed the overlapping issue in some texts in the Guild Bonus setting window. ◈ Fixed the overlapping issue in some texts in Outpost placement window during Node and Conquest War. ◈ It has been changed that Wharf icon would be displayed in Wharf button and Change Ship Appearance button.Conquest Score and Conquest Status window have been newly revamped. ◈ It has been changed that Black Stones and crystals cannot be extracted from locked items.Fixed the issue where window size of Beauty Album and Crafting Notes could not be changed when changing resolution. • Level this up to increase the chance of not consuming Energy while Gathering. 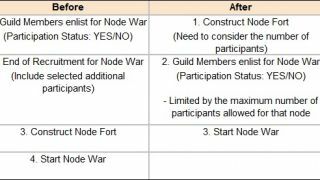 ◈ The setting window that appears when constructing Forts for Node Wars has been increased in size. ◈ Fixed the issue where you could not catch any fish while Fishing in certain areas. ◈ Fixed the issue where you could not get items while fishing in the Great Ocean because the waves were too high. ◈ Fixed the issue where items placed in Residence could not be used after being disqualified from Horse Race. ◈ Fixed the issue where a wrong system message would be displayed upon retrieving a table with a prop. placed on top of it in Placement Mode in your residence. ◈ Fixed the intermittent overlapping issue of the icons when registering Fairies. ◈ We are aware of the issue that typing into the Search BDO WIKI window in Help (F1) window would trigger Hotkeys and bring up other UIs. This will be addressed shortly.